The steps you take immediately after a car accident can either help or harm your odds of recovering fair compensation for the property damage, injuries and other negative impacts an accident may have on your life. Louisiana accident injury attorney Bart Bernard offers advice on actions you should take to protect your rights. Even minor fender benders can leave car crash victims feeling shaken, confused and scared. Try and remain calm and clear-headed as you take measures to gather pertinent information, preserve evidence and ensure authorities have a detailed report of the accident. The steps below are important to understand. If you have an accident, follow these instructions, and if you need help, contact our office. Bart Bernard will protect your rights, and he’ll be will be with you every step of the way. Immediately following the accident, call 911 and report the collision — even if the crash was minor and nobody appears to be injured. Police will document both sides of the story, along with their visual observations of damage and driver conditions, which is useful in establishing liability. Always ask for a copy of the police report. Assess yourself and your passengers for injuries. If an ambulance is dispatched to the scene, have emergency responders give you a full check-up and always seek medical attention after the police report has been made and insurance information exchanged. Unless your vehicle is blocking traffic, it’s best to leave it be. You can further protect the crash scene from interference by putting out reflective triangles or orange cones, and turning on your hazards. It can be helpful to use your cell phone to photograph the other driver’s insurance card and license plate number. Use your smartphone to take photos and video of the accident scene and damage to your vehicle and any others involved. Be sure to zoom in on skid marks, broken guardrails, road hazards or other pertinent clues that may pinpoint the at-fault party. Several car insurance companies even offer their customers free smartphone apps that can be used to document the crash scene details. If the accident happened in a busy intersection or other area where motorists or bystanders saw the incident, be sure to ask for the names and contact information of any and all witnesses. This is a common mistake in many traffic collisions. One person gets out and quickly apologizes, claiming they didn’t see the other. Even when you think you are partially to blame for a car wreck, let the insurance company and your attorney handle liability issues. Call your insurance company and report the car accident; this will begin the claim process. Even minor rear-end collisions can cause whiplash, concussion and other serious injuries. In some cases, symptoms may not appear for several hours or days. Anyone has been involved in a car accident should seek medical attention as soon as possible. Keep a file that includes all medical records, receipts and treatment protocols. This should include receipts from pharmacies, the hospital and any medical professionals who provided treatment for accident-related injuries. Regardless if negligent driving was to blame for your accident, you should contact a qualified personal injury lawyer who can protect your rights. Besides investigating the car accident, your attorney will take care of all the paper work and can negotiate with insurance companies to make sure you recover the highest compensation to cover all property damage, medical bills and other losses. To ensure the best possible outcome, always speak to an attorney before signing any statement or documents for the insurance company. 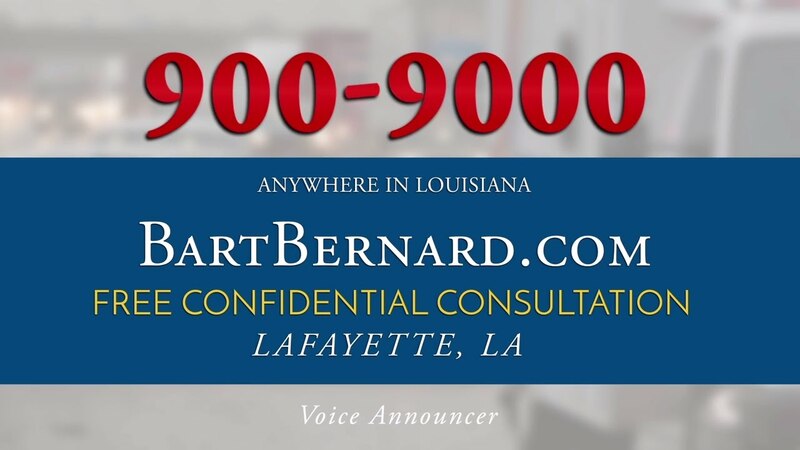 Louisiana attorney Bart Bernard delivers results for his clients and can help you maximize car settlement compensation. Over the past 20 years, his practice has procured several substantial wins in motor vehicle accident cases—put his experience and resources to work for you. Call our Lafayette, Lake Charles or Baton Rouge offices at 337-900-9000 and schedule a free consultation.